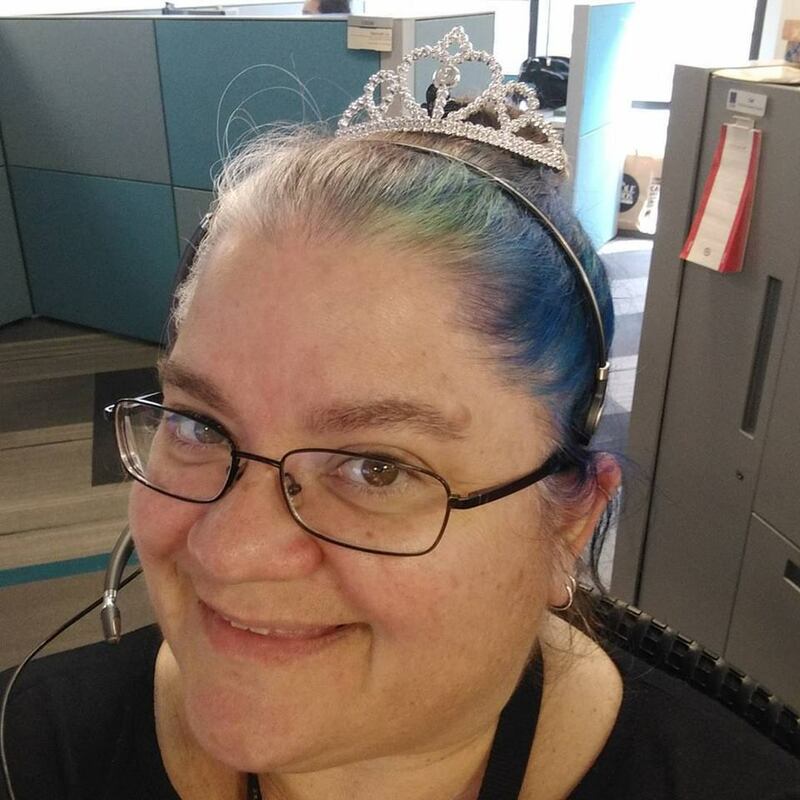 This is what 49 looks like in my world–tiara and bright hair! Social Media usage and the political climate over the past two years has seriously affected whether or not I posted my thoughts through blog posts. For a while there, my blogs were scattered in different locations, and then I started pulling them all together (here). But most of my social circles are on Facebook, and I just haven’t been as journal-consistent lately as in days past. As I’ve been reflecting on what I think about my birthday today and what I might plan for the next 365 days, my thoughts were unfolding with the need to bring back the simple blog post approach. Also, part of my reflections are (a) what are my current habits? and (b) what habits would I like to be building? What legacy will I take from my forties? Today I’ve turned 49. This starts the last year of this decade. And it’s been a wonderful decade. Seven years ago, my Sweetie and I entered into a relationship that has surprised us both. A month after our friendship had evolved into a “relationship,” I also found American Tribal Style (ATS®) Bellydance. It’s Sweetie’s fault (hee hee), a fact that has never quite been lived down. I moved from the Long Beach area after seven awesome years with my Best Roomie EVAR™ to several years alongside my bellydance community in a small rented room (piled high with crafty gear) to several years with my Sweetie (and most of the crafty gear now in storage, or piled high in one of two locations at the house). Gone are the large tea parties in our spacious living room, and ushered in are the dufflebags and totebags for living on the road and from small spaces. After 12 years of contract jobs, one right after another, I’ve spent three years now at one job downtown. It has helped me become debt-free, allow me to “buy a real car” for the first time, and allowed my Sweetie to flourish in a freelance mode with my administrative assistance. And I now help run or market several websites for several events or small business efforts. My dance path has moved from beginner to advanced student (taking up to 15-20 hours of class or rehearsal per week) to beginning instructor to now I’m teaching three times per week. Next year I should be able to launch my first two-hour block of classes since I finally have enough students to offer something in the intermediate level. There have been some really rough spots trying to teach, and I still don’t always have enough students every week. But my heart is still in it and my current students still fill my week with so much joy. My SCA involvement relaxed massively over the past seven years, and I’m still trying to find my favorite balance for that love. Santa season and Storytelling events and Instructor opportunities on my Sweetie’s schedule fill in between my full-time job, full-time commute, Dance instruction, and Crafy pursuits. I took an amazing workshop in January 2017 to specifically plan and dream about Goal Setting for Artists and Dancers. When I boiled down my dreams and goals, I found that my Keys are “Time and Space.” To make my dreams come true, I just need “Time and Space.” I’m still working on creating and reserving that time for my efforts. And I definitely could benefit from carving out the space needed. Nothing comes just by wishing for it. You have to plan and then work for it. I do love that I took some of my Facebook efforts and motivations for other people and turned it into a project and community. If you’re not already following Daily Movement Prompts, you are invited to check it out. I post on that blog, sometimes with pithy quote images, other times just with conversations and thoughts about intentional movements. They’re not always daily, but I do my best. There’s a Secret Group on Facebook associated with the private community. Contact me if that’s something you might like to participate in. My artistic pursuits have expanded beyond the framework of SCA-specific research and efforts, although my love for history and re-creation has not waned. I just also love to spin modern fibers with some very modern (invented!) techniques. I’m also now madly in love with thinking about indigenous techniques from the people in the Andes mountains, especially techniques passed down from before Pre-Columbian western contact. I’m indebted to Abby Franquemont for her Backstrap Weaving intensive class at PlyAway2, and cannot wait to spend additional time in both the modern textiles community and the indigenous weaving techniques. Where Will I Go Next? There are publishing plans in the works for our home business for my Sweetie and me. I have dance and activity plans for my body and will need to figure out what that means to be an athlete in my 50s when my next decade arrives. And my big dream is to travel. I want to travel for teaching dance. I want to travel with my Sweetie’s teaching opportunities. And I want to travel (both local and worldwide) to see friends and family, and really enjoy this amazing planet we’re on. There might need to be employment refinements to afford me the opportunities for travel. But I’ll have my eyes open. And I’m hoping to remember how to share my travel missives again with my friends and family. So you might be able to expect to see more blog posts again. I have been thinking about how to achieve goals, how to prioritize tasks competing for my attention, or how to launch new ventures without failing in others. And I realized I could fall into the trap of, “DO ALL THE THINGS!” as my personal Step One. I will never get to “Profit!” if I leave out Step Two. One problem with “DO ALL THE THINGS!” is that it can easily spiral into a plaintive, “Do all the things?” followed by a resigned whimper. But What are my Step Two Tasks? Here’s where the new ideas have started to form. The “use my strengths to build additional habits” is an old idea that I’ve been working for years. But what about this “Step One: Idea; Step Two: ___; Step Three: Profit!” notion? I need more Step Two elements in order to get to my goals. And this is when I have to start to prioritize all the Step Two options. Sure, I could be making more flowered hair clips or painting or sewing a coin bra for bellydance or cleaning out the freezer. But is my Sweetie waiting for me to design a postcard? Are the poets waiting for me to complete my assignment for the publication that comes out at Coronation? Do I need to work on this spreadsheet or this website update or this hand-sewing on my linen costumes? Or should I go running for 30 minutes? Step Two is important. Step Two candidates abound in excess. Step Two Priorities are now my biggest challenge. 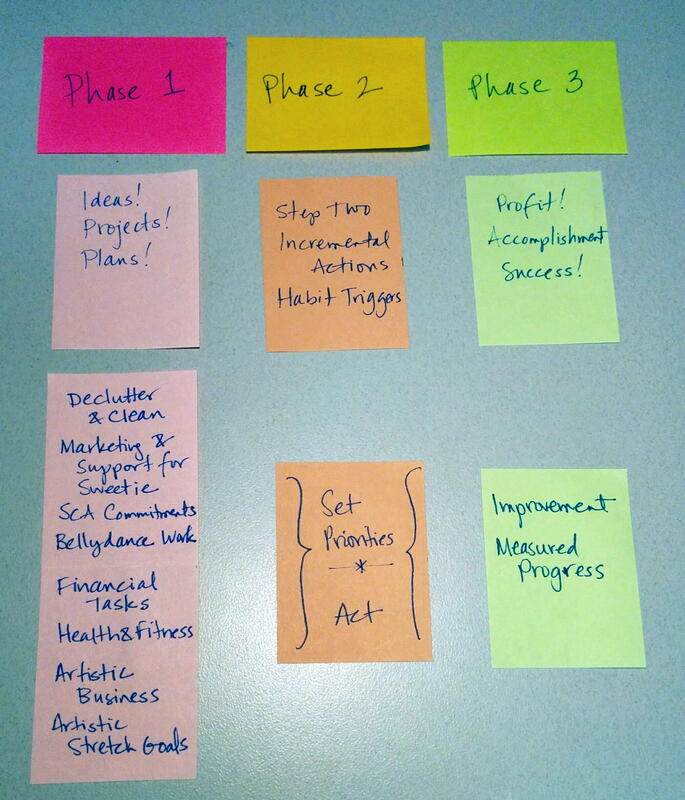 Which Goal, which “Step three: Profit!” am I working towards, and which people are affected by my success or failure on this step? Apparently I cannot actually DO ALL THE THINGS. But I can start to improve *which* “Step three: PROFIT!” that I’m working on at the moment. Then I can prioritize the various Step Two actions I need to take.